direction -- in a single plane such as up and down -- are called polarized light. 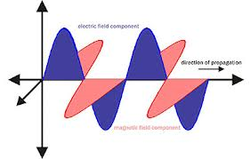 Those that are vibrating in more than one direction -- in more than one plane such as both up/down and left/right -- are called unpolarized light. resulting light will be polarized light of half intensity. If two polaroid filters are used and placed so that one is rotated 90 degrees to the other, no light will be able to pass. the lessons learn from the Youtube video. light source and two polaroid filters.